check and drug test. Can others working in your store or in your home prove that? 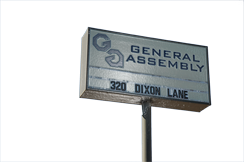 General Assembly, Inc., a professional merchandising services organization, helps national retailers and their suppliers to reach their ongoing consumer service and sales objectives. This is accomplished by partnering in key areas to complete complex product assembly with our highly trained technicians to free up retail associates for other customer service priorities; support increased sales by merchandising ready-for-customer use products; reduce product returns with product assembly verified to manufacturers’ specifications; and rapidly integrating to seasonal merchandising windows throughout the year.